CANTON, Mass. – Every team talks about the importance of cashing in on power play opportunities, but teams don’t typically expect to have as many chances as Canton did on Saturday night. The Bulldogs were given a man advantage 11 times against Mansfield and scored three times, including twice in the first period to take control. 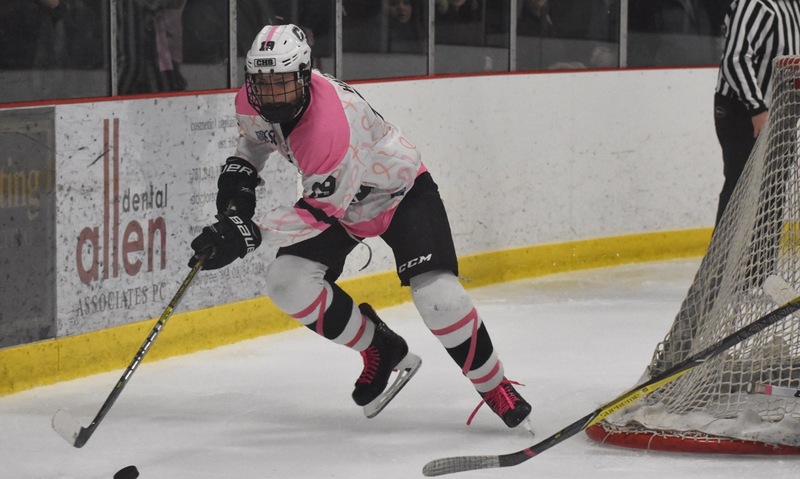 Special teams were the story of the night for Canton, which added a crucial shorthanded goal late in the third period that sealed the win, and the Bulldogs skated away with a 4-0 victory over the Hornets on Hockey Fights Cancer night at the Canton Ice House. Mansfield started the game with a flurry of chances, using an early power play of its own to spark its offense. Matt Copponi, Jack Garland, and Jake Lund were some of the Hornets who created early scoring opportunities but were denied by Canton senior goalie Mike Staffiere (22 saves). With nine minutes left in the first, Brian Grant stepped up and had a chance driving to the net. Staffiere got a piece and the rebound trickled just wide of the post and seconds later Braedon Copparini had a shot that went narrowly wide as well. Three minutes later, Canton took the lead. On the power play, Johnny Hagan weaved his way past several Mansfield defensemen and slipped a backhand shot under Mansfield goalie Sean McCafferty, who managed to keep it out but then the rebound was pounced on by Ryan Nolte. Just three minutes later and the lead was doubled. After a penalty was called, the Bulldogs had a face-off to McCafferty’s left. Hagan was kicked out of the face-off and Nolte stepped in. He won the draw back to Hagan, who was cutting across the circle onto his forehand. The junior forward took the puck in stride and rifled a wrister inside the far post to make it 2-0. McCafferty (35 saves) stopped a shorthanded breakaway chance by Tommy Ghostlaw before the end of the period and he kept that momentum going in the second, making 19 saves in that period alone. The Hornets were called for six penalties in the second and spent all but about three minutes on special teams in the period. Hagan nearly got his second assist of the game when he set up Jack Connolly pinching in at the back post only to have McCafferty get across and get a shoulder to it. Hagan also hit the post and had another big chance saved when Connolly found him in space inside the circle. Chris Lavoie had several chances driving towards the net from the right circle but couldn’t find the angle to beat the goalie. Tommy Vaughn had one of Canton’s best chances when he stole the puck from a Mansfield defenseman right in front of goal but sent his shot over the bar. Despite playing down a player for much of the period, Mansfield did have a couple of chances. Nick Levine had a shot from the point that was saved and the rebound nearly caromed back in off a Canton defenseman. The best chance of the period fell to Austin Ricker, who got a clean breakaway shorthanded only to be stoned by a great blocker save from Staffiere. Mansfield cleared off 1:16 of a penalty that extended into the third period and the Hornets were still in the game, down just two goals. Canton had the first good chance of the third when Ryan Colby rode a pair of challenges and still managed to slide the puck just wide of the post. Hagan and Nolte combined again on another power play chance but again McCafferty made the stop. With six minutes to play, the teams traded great chances. Copponi flicked a pass into the slot for Coleman O’Brien but the senior missed the net with his shot and then seconds later Joe Robinson had a breakaway but the puck slid off the toe of his stick when he went to shoot. Staffiere came through again to protect the lead when he made the save on a chance for Garland in the slot. That proved to be critical inside a minute when Hagan blocked a shot at the blue line, turned it into a breakaway and then calmly picked his spot to beat the goalie for a three-goal lead. John Gormley had a chance for Mansfield that hit the bar and stayed out and with just a minute later, with three minutes left, Canton secured the victory on its 10th power play of the night. Connolly fired a shot from the point and Timmy Kelleher had the deft tip to find the back of the net. Hockey Fights Cancer night at the Ice House was held in honor of Reo Todesca and Kristin Rocha, who were both connected to the Canton hockey program and both passed away a year ago. Proceeds from the night were donated to the Reo Todesca Memorial Foundation and the Kristin Rocha Memorial Scholarship. Canton (6-0) will travel to face King Philip on Wednesday night, while Mansfield (7-2) will travel to the New England Sports Village to face North Attleboro. Albert is coming off a remarkable sophomore season in which he was among the league’s leading scorers and helped the Tigers make an improbable run to the Div. 2 South semifinal. Albert scored 17 goals and recorded 15 assists last year and is a tenacious forward in the attacking zone, chasing every puck and capable of making plays anywhere in the offensive zone. Although not the biggest forward, Albert never shied away from a hit and his speed makes him a threat wherever he picks up the puck. 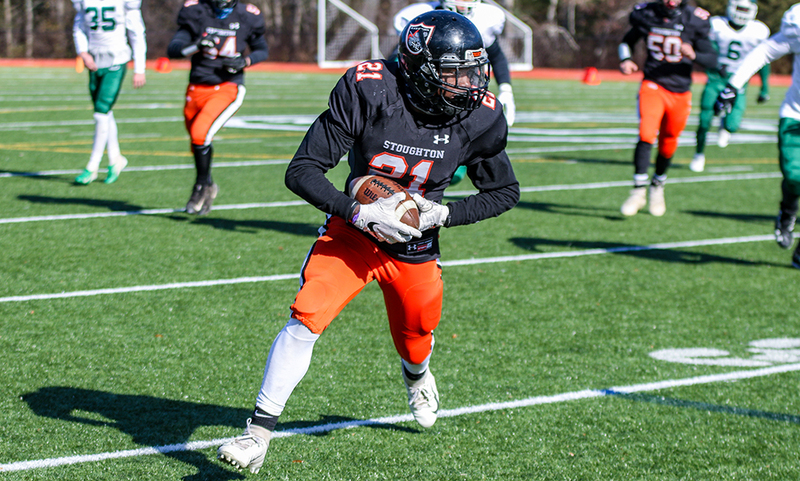 Taunton has been a program on the rise over the past few seasons and Albert’s skill and scoring touch have the Tigers confident of continuing that upward trajectory this winter. The reigning HockomockSports.com Underclassman of the Year, Hagan is one of the top forwards in the Hockomock League and part of the league’s most dynamic scoring duo, along with senior Ryan Nolte (see below). Hagan was tied for the team lead with 36 points last year, including 14 goals and a team-high 22 assists, and came through in the clutch with nine of his points coming in three playoff games. He seems to love the physical part of the game and is very difficult to dislodge from the puck when he is breaking into the zone and he has the vision to find seams to set up his teammates or take the puck to goal. 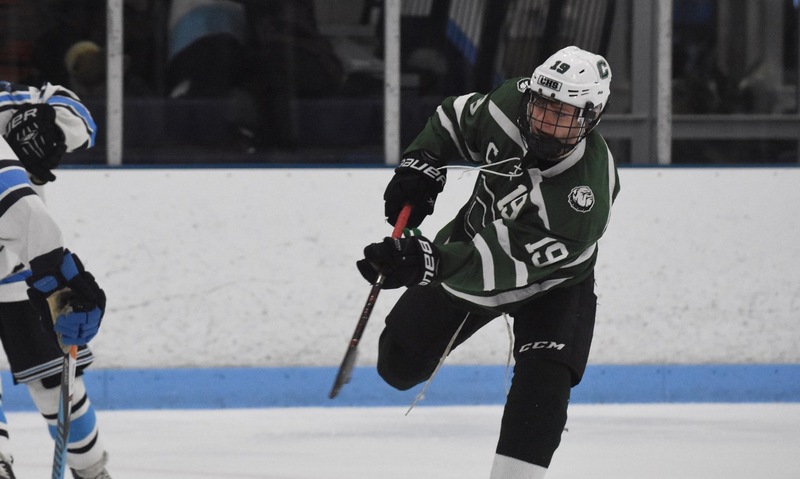 Hagan has an impressive shot and a love for the big hits (which sometimes gets him in trouble with penalties) and when he is on the ice opposing defenses have to keep an eye out for him at all times. Canton has been consistently among the top teams in Div. 2 and Hagan’s growth on the first line should keep the Bulldogs in that category again this winter. Lizzotte is one of Franklin’s top returning forwards from last year’s league title-winning side and he could make the move up from the second to the first line for the Panthers this season. His energy and tenacity in the offensive zone made him one of Franklin’s top scoring threats, as the Panthers advanced to the final of the competitive Mount St. Charles tournament and got a point for the first time against Malden Catholic. Lizzotte scored nine times and assisted on four other goals, partnering with Zac Falvey on the second line and both are back to keep Franklin rolling into a new season. Lizzotte utilizes his speed to open up space for diagonal passes and is willing to chase pucks into the corners to try and keep the offense going. In addition to league play, Franklin has a schedule loaded with some of the top teams in Div. 1, so Lizzotte and the forwards will need to be firing right from the start to help the Panthers compete with some of the state’s best. 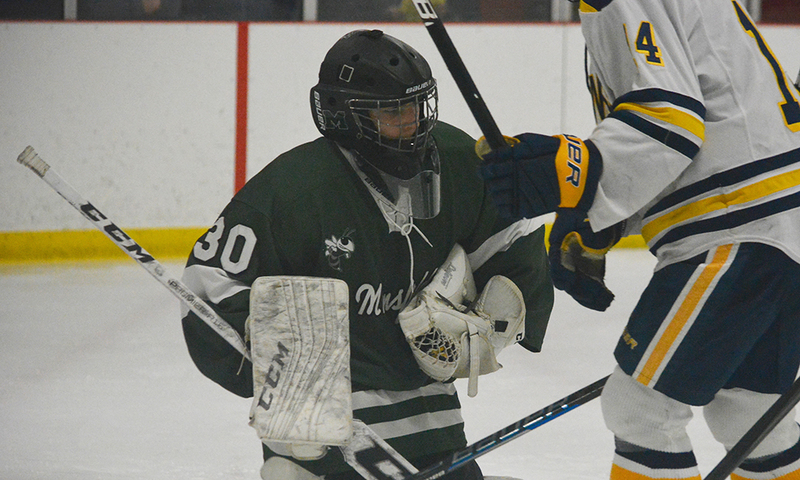 McCafferty has put in two impressive seasons for the Hornets and he will be one of the top returning goaltenders this winter, as Mansfield looks to challenge Franklin for the league title and make some noise in the state tournament. As a sophomore, McCafferty allowed only 1.85 goals against and saved 92 percent of the shots that he faced. Overall, he made 377 saves last year and had a solid performance in the loss to Xaverian in the tournament. McCafferty is quick with a strong glove and does a good job of positioning to be in the right places to make saves. The loss of graduated defensemen Tyler Oakley and Tim Arnold will make McCafferty’s communication with the blue line group even more important this season, but at least the Hornets know that there will be a solid last line of defense if things do break down. McCafferty will be tested this season, but the Hornets are confident he can come through and give them the type of performances needed to push Franklin and try to win a first league title since 2011. 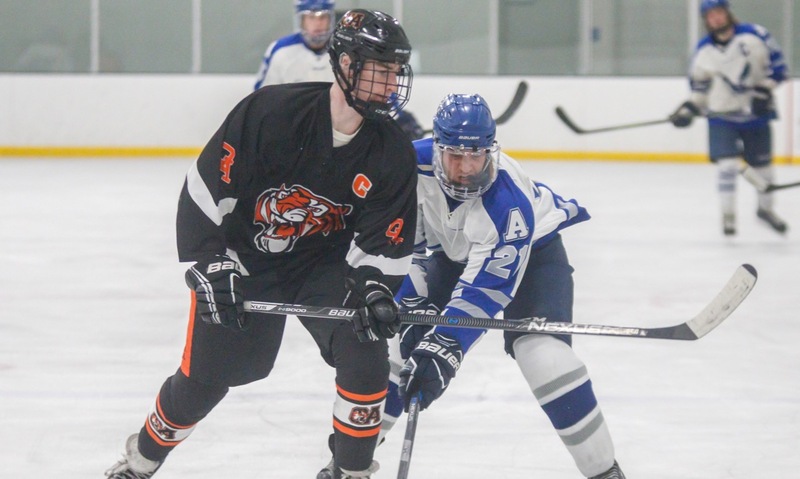 McCormack has been one of the most consistent defensemen in the league over the past couple of seasons and is an imposing figure on the blue line for the Tigers, who will be hoping to challenge perennial power Franklin for the Kelley-Rex division title. In addition to his physical presence in the defensive zone and his ability to dominate the crease, McCormack also chipped in on offense, scoring eight goals and providing eight assists. His passing in the transition game is a key to the Tigers taking advantage of their speed in the forward lines and he has a rocket of a shot from the point. Teams look for reliability from the blue line and McCormack has provided that for OA the past few seasons, limiting the opposition’s scoring chances and adding toughness to the lineup. With McCormack in the back line, the Tigers will be confident of keeping pace with the top teams in the division. With the graduation of leading scorer Jake Parker, the Bombardiers will be counting on Morry to continue his development into a top line center. As a sophomore, Morry centered the second line and was part of the top power play and penalty kill units and he contributed 11 goals and 15 assists to help Attleboro get back into the state tournament. This year, the skilled, physical forward will be counted on to make up some of the production lost from Parker’s graduation and continue playing big minutes (more than 25 minutes per game last season). He has solid stick-handling skills and an accurate shot on the move, but it is his vision and ability to pick out the right pass under pressure that makes him effective for the Bombardiers. With Sam Larkin back after a year at juniors and a year of experience for Morry, Attleboro has the pieces in place to make another run at a playoff place. 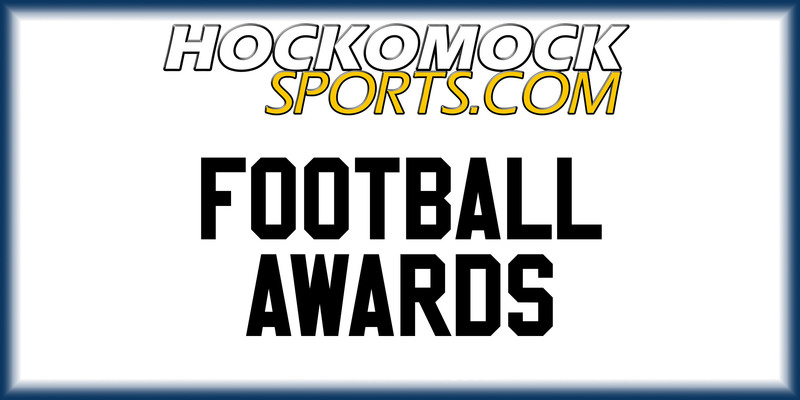 The 2017 HockomockSports.com Underclassman of the Year and 2018 Player of the Year, Nolte is arguably the top two-way forward in the Hockomock League and leads the top line for the Bulldogs, who went unbeaten in the Hock last year. His partnership with Johnny Hagan (see above) was the league’s most dynamic last year and they are back to try and bring another league title to the Canton Ice House. Nolte scored 18 goals and had 18 assists for the Bulldogs and was also part of both the penalty kill and the power play because of his work in all three zones. Physically strong and with impressive skill with the puck, Nolte can score in a variety of ways and is not afraid of getting into the crease and causing havoc in front opposing goalies. He is also a patient attacker, willing to cycle the puck and wait for the right opening. Canton has high expectations every winter and this season is no different, as the Bulldogs look to secure another league title and make a run at an elusive sectional title. Tasker jumped into the mix for Franklin and made a quick impression as a solid performer on the blue line in all three zones, providing big hits and a hard shot from the point. Now as a junior Tasker has solidified himself as a mainstay and one of the leaders of the Panthers defense as they try to continue their dominance in the Kelley-Rex division and make another run in the tournament. Tasker is a physical presence in the defensive zone but also showed good touch on his outlet passes to get the Panthers into the attack quickly. He scored four goals and had four assists last season and became a dangerous weapon on the power play. After a year of experience on the varsity level, Tasker will be one of the leaders in the back line and keep driving the team forward from the defensive zone. Expectations are high for Franklin defensemen but Tasker seems more than capable of meeting them. Tully spent a year in juniors but returned last season to lead the Warriors to the best season in program history. The senior defenseman will hope to repeat that success this year, as not only the leader of the team’s blueline corps but also as one of Foxboro’s top scorers. 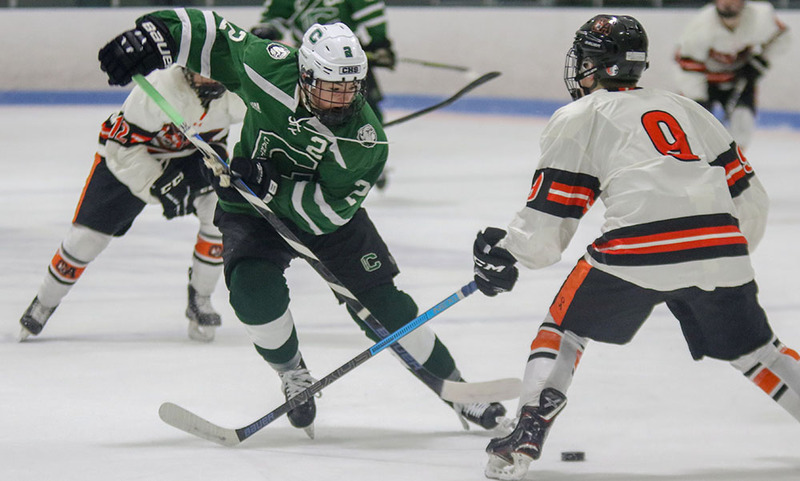 Tully scored 19 goals and had 18 assists from his defenseman position, which was among the top scorers in the Hockomock League regardless of position. He is a skilled player with the puck, but can also play the physical game necessary to keep opponents away from goal. With his speed and game IQ, Tully can cover a lot of ice and always seems to be in the right position to make plays in either zone. Coming off a 10-win season, the Warriors will be turning to Tully to lead another run at a state tournament berth and continue the program’s forward momentum. Warren has been one of the league’s top goaltenders for the past three seasons and he enters his senior year with the opportunity to help North Attleboro unseat Canton at the top of the Davenport division. Warren, the 2016 HockomockSports.com Underclassman of the Year, allowed only 2.75 goals per game last season and held 11 opponents to two goals or less, which gave the potent North offense the chance in just about every game. A quick and agile goalie, Warren makes some of the most difficult saves seem easy and he came through against some of North’s toughest opponents, such as 36 saves against Franklin or more than 50 stops against Canton. When Warren is on his game, North can compete with anyone in Div. 2 and the Rocketeers will be counting on consistent performances this winter as they make another run at a league title. With Warren back in goal, a tournament run isn’t out of the question for North as well.